All our turbo chargers are designed and made by Turbo Technics, who specialise in automotive turbochargers and associated turbo equipment. Turbo Technics are a world-class company acting as consultants to many car manufactures who use their turbo re-manufacturing facility for many car brands including JLR, which gives us the edge with our specially made Hybrid turbos as we know that they are built correctly and come from the same factory which Land Rover use for their own re-manufactured turbos! NOTE: TD5 fixed boost box or raised boost pressure limit in a remap is required for this turbo installation ( we included free with the turbo purchase), as well as a remap to the main engine ecu to gain the best functionality from the hybrid turbo. In some hi flow cases a “BAS maf adjust box” is needed to keep the air flow meter in its working voltage tolerance. We strongly advise you fit this turbo ONLY along side a performance inter cooler that has at least 17 rows of tube at 62x8mm to maintain a good pressure balance and to help with charge cooling and that the turbo is fitted by a professional garage or workshop. We insist on all turbo charger installations you fit new engine oil and oil filter as well as a new oil feed pipe when making your installation. We also do not advise fitting with snorkels or restricted air intakes. This turbo is designed for road use only! designed for up to 185BHP with correct tuning, the turbo generates upto 1.4 bar of boost in most cases. NOTE: TD5 boost signal clamp box is required for this turbo installation (included FREE) or you can have remapped to suite the higher pressures used and not fit the boost signal clamp box, also in some hi flow cases a maff bypass needs doing to keep the air flow meter in a working tolerance. 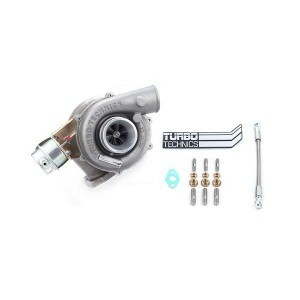 We strongly advise you fit this turbo ONLY along side a performance intercooler and a strong air intake pipe. This turbo is NOT designed for use with a snorkel or raised air intake. Turbos have no warranty if used for Race, Competition or Rally use on road or off road cars.